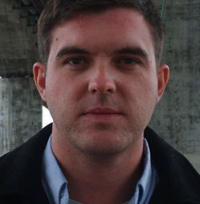 Kevin Powers was born and raised in Richmond, Virginia, graduated from Virginia Commonwealth University, and holds an MFA from the University of Texas at Austin, where he was a Michener Fellow in Poetry. He is also a veteran of the Second Gulf war, serving in the in the US Army in 2004 and 2005, where he was deployed as a machine gunner in Mosul and Tal Afar. His first novel is The Yellow Birds, set during the conflict in Iraq, an unforgettable account of friendship and loss. It was awarded the 2012 Guardian First Book Award. Private Bartle returns home after his tour in Iraq, numbed by the trauma of fighting in the heat and dust and traumatised by the death of his closest friend out there, to whose mother he'd made a solemn promise that he would ensure his safe return. Powers' poetic language contrasts sharply with the horror and absurdity of the war he depicts and comparisons have been made with Joseph Heller's Catch-22, Michael Herr's Dispatches, Tim O'Brien's The Things They Carried and Erich Maria Remarque's All Quiet on the Western Front. In this exclusive interview with Foyles, Kevin discusses why he signed up for military service, the difference in covering war through art and journalism and empathy as an act of imagination. How did you come to join the army at the age of seventeen? I wasn't a particularly good student in high school, but I knew that I wanted to go to college. And given the fact that there is a long tradition of military service in my family, enlisting always seemed like a viable option. It was neither encouraged nor discouraged, but I had by then inferred that the military was where a person went to develop the qualities I had come to admire in my father, my uncle, and both of my grandfathers. The cliché, in my case, was true: I thought that the army would "make me a man." First World War poet Wilfred Owen wrote in the Preface to his poems: "My subject is War, and the pity of War. The Poetry is in the pity". Does this apply to The Yellow Birds? I can only say that the impulse to write The Yellow Birds came from a desire to look for some truth that I hoped could be found at the core of that most extreme of human experiences. I also thought that by placing the emphasis on the language, using it to demonstrate Bartle's perpetual, unbearable sense of awe and wonder, I'd have at least a chance of connecting to another human being on an emotional level. I wanted to engage with the imagination above all else, because I believe that empathy is an imaginative act. What sort of reactions to your book have you had from those with combat experience in Iraq? I don't know that many vets have had a chance to read it yet, but I have had several kind messages of encouragement and support for which I am deeply grateful. You're also a poet and this comes across in the deeply lyrical quality of your prose. Was this intended in counterpoint to the rawness of the dialogue? I intended it not just as counterpoint to the rawness of the dialogue, but also to the rawness of the experience. In that respect it is more point than counterpoint. In trying to demonstrate Bartle's mental state, I felt very strongly that the language would have to be prominent. Language is, at its essence, a set of noises and signs that represent what is happening inside our heads. If I have faith that those noises and signs can be received and understood by another person, than I should also have faith that they can be made more finely tuned. You've said that you were asked most often what it was like in Iraq on your own return. Do you feel that fiction works better than reportage in overcoming people's squeamishness and portraying the reality of combat? I wouldn't say that it works better, only that it works in a different way. The benefit is that it can confound expectations, particularly in the case of these wars that have been going on so long. It is perfectly understandable that people become inured to the violence when it is presented to them in the same way for ten years or more. Art will sometimes allow you to see the same thing in a new way. But this is only possible because artists don't have the same kind of responsibilities as journalists. The work that journalists do during wartime is utterly essential and, to me, incomprehensibly difficult. One particularly poignant moment comes when Bartle make a promise to the mother of his future comrade-in-arms Murphy that he'll make sure her son makes it home safely, by which time in the book we know he will not be able to do. Is Bartle's guilt fuelled more by Murphy's death or his own survival? I would not be able to separate the two. The root of his guilt is that he wanted to be good, and he tried to be good, but he failed. His conflict is between his desire to redeem that failure and his acceptance of complete powerlessness. The Yellow Birds has already brought comparison with books as diverse as Erich Maria Remarque's All Quiet on the Western Front, Joseph Heller's Catch-22 and Tim O'Brien's The Things They Carried. Were there any particular books that served as an inspiration to you? Those books were all very meaningful to me. I would include Meditations in Green by Stephen Wright, as well as the poetry of Yusef Komunyakaa. I have a collection of poems I'm nearly finished with. And I've begun work on my second novel, about a murder that takes place in Virginia just after the American Civil War.